Many of us have at one time or another came in contact with those who could care less about serving God. Some may ask why does God allow wickedness in the earth, while others may wonder how long will it continue and does God really notice? Such questions were also asked by the psalmist and God answers nothing goes unnoticed by Him! Even though the wicked press on in their evil ways God gives rest unto His people through their adversity while the pit is being dug for the wicked(Psalm 94:1-13). O Lord God, to whom vengeance belongeth; O God, to whom vengeance belongeth, shew thyself.2 Lift up thyself, thou judge of the earth: render a reward to the proud.3 Lord, how long shall the wicked, how long shall the wicked triumph?4 How long shall they utter and speak hard things? and all the workers of iniquity boast themselves?5 They break in pieces thy people, O Lord, and afflict thine heritage.6 They slay the widow and the stranger, and murder the fatherless.7 Yet they say, The Lord shall not see, neither shall the God of Jacob regard it.8 Understand, ye brutish among the people: and ye fools, when will ye be wise?9 He that planted the ear, shall he not hear? he that formed the eye, shall he not see?10 He that chastiseth the heathen, shall not he correct? he that teacheth man knowledge, shall not he know?11 The Lord knoweth the thoughts of man, that they are vanity.12 Blessed is the man whom thou chastenest, O Lord, and teachest him out of thy law;13 That thou mayest give him rest from the days of adversity, until the pit be digged for the wicked. God is clear He will repay upon the head the ways who’s heart walks after their detestable things, and are contrary to Gods holy ways(Ezekiel 11:19-21). 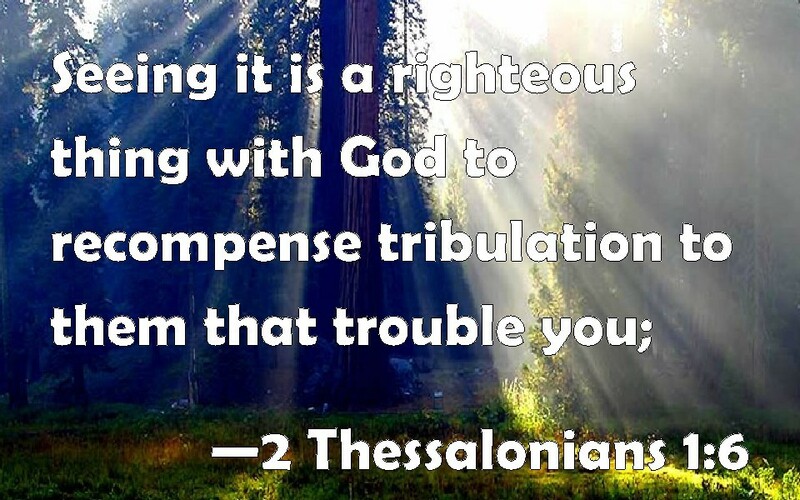 God knows those who are His (2 Timothy 2:19), and for those who trouble His people God repays tribulation to them (2 Thessalonians 1:3-10).